Carol Varsalona is hosting Poetry Friday this week. Visit Beyond Literacy Link for the PF round-up and for Carol’s Winter Wonderland gallery. Happy Poetry Friday! January is hobbling to its frigid, icy end. It’s been a cold month in Maryland, as the blue hues of my temperature scarf will attest. The annual February Poetry Project members are warming up for our month of daily writing. This year’s project theme is “Ekphrastic at Home.” Each day, a member of the group will share a piece of art that they own or keep on display at home. Today’s warm-up prompt is one of three paintings I own by my grandmother, Joy Dickson. A New Yorker, child of a German Jewish engineer and his Romanian wife, Joy was destined to be a concert violinist. While studying at Julliard, she met my grandfather, a percussionist who had moved to the U.S. from France as a young child. His name was Charles Dickson. They married, struggled to start a business together, had three children (my father was the eldest). I don’t know whether she completed her degree at Julliard, but Joy never picked up a violin again. Although she died nearly 15 years ago, I feel like my children have grown up around Joy because her art has always been a presence in our home. The piece I shared today, a portrait of her mother Rachel (known as Rose), was probably painted when Joy was in her teens or 20s. It was an honor to Joy’s memory to read the poems everyone wrote in response to her painting today. Some people wrote about the deep connection between mother and daughter, as if they knew the story behind this portrait. My own poem is a memory of the last words I heard my grandmother say. It was the summer of 2003, and she was doing hospice at my parents’ home in mountains. No one had heard her voice in days. a kiss on my bare shoulder? On Monday, I’m participating in a guest-post at Nerdy Book Club about distance reading groups. If you geek out about middle grade books, give it a read! Happy Poetry Friday! Jan Godown Annino is putting on a poetry spread for us this week at Bookseedstudio. This is a year of big transitions for my family. Our youngest turns 18 this week and is preparing to make the leap from high school to college. Shortly after that, Mr. S turns 50 and our eldest celebrates his 21st birthday. I am relying on long-term projects to sustain me in 2018. There are writing projects, of course. A new book is in the works, but my first goal is to finish the 2017 February Poetry Project prompts before February 2018’s new daily prompts begin. 27 down and 1 to go! More on that in a second. I’m using nine colors in a variety of weights, but mostly sock yarn. My second project combines knitting and science. A friend shared this pattern with me and I am in love. You pick yarn colors (9, 10, 15 — knitter’s choice) and create a chart of temperature ranges with corresponding colors. Over the course of the year, you chart the temperature (I’m doing daily highs), and knit a row or two in the corresponding color. Instead of stockinette stitch — and after frogging a few false starts — I’m doing a K1, P1 rib. I am having so much fun with this project! Here is the pattern at the Ravelry crochet and knitting site. It’s beginner friendly. Back to poetry. When our children were small, we planted a tree for each of them not far from the kitchen window. Our eldest chose a gingko. Despite the cold weather, as evidenced by my knitting project, the tree is covered with little knobs. These will become buds in a few months. As I work on the last few poems (late — so late!) from last year’s daily poetry project, it’s the ginkgo I see from my work space. And that’s how the tree found its way into this poem. then it could be true for all of us. We’re kicking off a new year of poetry at Reading to the Core. 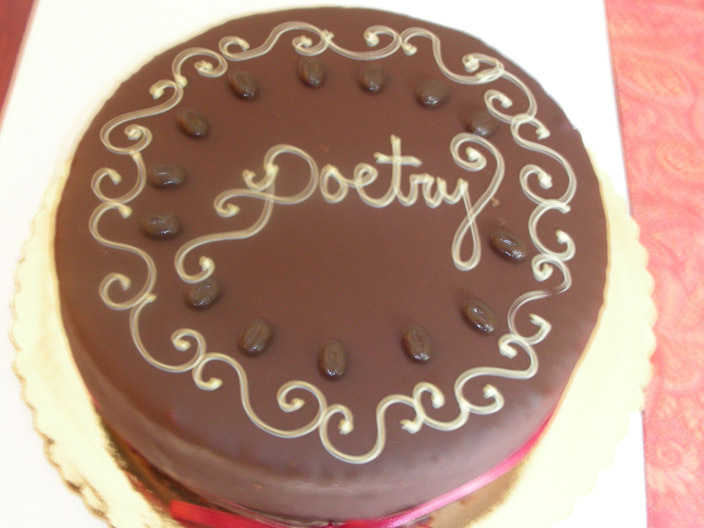 Stop by Catherine’s blog for all of this week’s poetry links. Happy 2018, poets and poetry lovers. Before you know it, February will be here. That’s right. It’s almost time for our annual daily writing workout. A little history: For four years, my blog hosted a community poetry project. Last year, the project moved to a closed Facebook group to accommodate our growing community of about 60 poets. The 2017 project theme, 10 Words Found in the News, helped us create beauty, humor, and satire in response to current events. This prompt worked so well that, when February was over, we continued to write 10 Words in the News poems throughout the year. This year, we’re heading back to the project’s visual-prompt roots. Find a full definition at the Poetry Foundation. The theme of this year’s project is ekphrastic poetry (writing in response to works of art), but with a twist. Poet Ann Haman suggested that we write in response to art pieces owned by members of the group. Beginning January 31, a group member will post a photograph of a work of art (loosely interpreted) from their home collection. Art pieces might include paintings, sculptures, kids’ creations, photographs, or beautiful oddities. There will be a sign-up in the group’s files for those who’d like to be in charge of a daily writing prompt. Special thanks to Kip Rechea, a past participant who will be acting as a group moderator and providing some administrative help. IMPORTANT NOTE FOR PROJECT NEWBIES: As always, the point of this exercise is to practice the habit of writing regularly, even if it’s just for one month. Members of the project post response poems the same day so that we can focus on generating ideas and giving positive feedback, rather than polishing for publication. Interested in joining us? You can request to join the closed 6th Annual February Daily Poem Project here.